From giant warehouses to small “mom & pop” businesses on the corner, Anago of Las Vegas has provided high-quality commercial cleaning services to businesses of all sizes and types. With more than 30+ years of experience in the industry, Anago has set the standard, proudly offering that same level of service to every client. Let us put our experience to work for you; we’ll give you exceptional commercial cleaning service in Las Vegas to ensure a safe and healthy environment for you, your employees, and your clientele. Get started today! 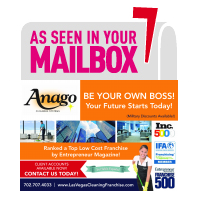 Call Anago of Las Vegas at (702) 903-2855 to schedule services or arrange for a customized consultation. Our professional cleaning crews are available anytime, 24 hours a day, seven days a week, and are available as often as you need. Whether you want monthly, weekly, or even daily cleaning done, Anago of Las Vegas is here to provide the best janitorial services in the Las Vegas area. By utilizing our SmartClean™ system, we ensure that our cleaning specialists consistently complete every single task to absolute customer satisfaction. Our dedication to clean goes beyond the location in question. We are committed not only to keeping your facility clean but our environment as well. That’s why we offer green cleaning services using eco-friendly methods and technologies to minimize our impact on the environment. We utilize specialized dispenser systems, green cleaning solutions and products, multi-filtration HEPA vacuums, microfiber cloths and mops, and more to leave your facility immaculately clean from top to bottom without harming our planet. We customize our services to your specific needs, taking into account your budget and schedule. We also provide emergency cleaning services within two hours of your call. Our 24/7 client support line is available for your questions or concerns any time of day. If you find that we have not completed a task to your satisfaction, simply call us and we’ll dispatch a crew to make it right. That is our guarantee to you. If you're ready to have professional commercial cleaning services take care of your building, call Anago Las Vegas at (702) 903-2855 or contact us online today for a FREE service quote!